It’s the all-electric car that looks like a regular Volkswagen Golf. Since its launch in 2014 the e-Golf has been at the forefront of the German manufacturer’s electric vehicle offering. In its latest guise the zero emission e-Golf has new battery technology, revised styling and a host of connectivity features both in the car and in the customer’s hand via their mobile smartphone. Available to order from today at Volkswagen’s nationwide network of specialist e-Retailers, it is priced at £32,190 RRP OTR, or £27,690 with the Plug-in Car Grant included. And it gets better. Participating Volkswagen e-Retailers are offering a deposit contribution of £1,000 at 4.9% APR representative on the updated e-Golf when the customer purchases the car using Volkswagen Financial Services’ Solutions Personal Contract Plan. Volkswagen has enhanced the efficiency of the zero emission e-Golf and the result is a real driving range increase of 50 per cent compared to the outgoing model. A range of 186 miles is quoted from the official New European Driving Cycle, while with driving style and other parameters considered the range is effectively 124 miles. This is achieved thanks to an increase in the energy capacity of the e-Golf’s lithium-ion battery from 24.2 kWh to 35.8 kWh. Power is increased to 100 kW, or 136 PS. This is up 15 kW in comparison to the previous generation e-Golf. That means the performance figures are improved too, with the 0 to 62 mph time now 9.6 seconds and a top speed, where the law permits, of 93 mph. Torque is boosted from 270 Nm to 290 Nm. As before, drive is via a single-speed gearbox. That 124-mile range ensures the e-Golf is practical for the vast majority of commuter journeys. 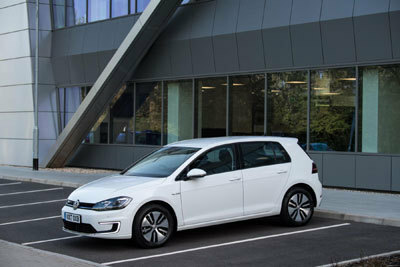 When the e-Golf needs charging the battery can go from empty to 80 per cent full in just 45 minutes when a 40 kW DC rapid charger connection is used. Alternatively, charging from empty to full from a wallbox charging takes approximately 5 hours 20 minutes, which opens the opportunity to charge the car conveniently during the working day or overnight. Staying with the convenience theme, Volkswagen’s innovative Volkswagen Car-Net mobile smartphone app makes it easy for the e-Golf owner to access various functions of their vehicle. They can start or stop the air conditioning from outside the car, even when it’s locked. They can also set the preferred time for charging to start and stop. And the most recent parking location of the e-Golf is displayed at the touch of a button. That’s only the start of the range of online services now offered with the e-Golf. The standard Discover Navigation Pro infotainment system includes Gesture Control and is operated via an enlarged 9.2-inch colour touchscreen. It includes satellite navigation with European maps and a voice recognition system for controlling the telephone and navigation functions. An additional feature of Discover Navigation Pro is that it includes Car-Net ‘Guide and Inform Plus’. This is a function that brings a suite of online information into the e-Golf including traffic, fuel pricing, parking space availability and weather conditions. Along with Volkswagen Car-Net App Connect and ‘Guide and Inform Plus’, every e-Golf is equipped with the third pillar of Car-Net: ‘Security and Service’. The driver or front passenger can press a button mounted in the roof to speak to a Volkswagen customer service advisor, from where they can ask questions about the car or book a service. They can also press a separate button to call the emergency services. If the car detects that it has been involved in an accident, a connection with the emergency services will be established automatically. Completing the interior of the e-Golf is the optional Active Info Display, which replaces the traditional instrumentation with a 12.3-inch high-resolution TFT screen that can be personalised so that it displays the information the driver wants to see. The exterior of the five-door car features all-LED lights at the front and the rear. The lighting is further enhanced with the flowing indicator function at the rear, where the orange indicator light ‘sweeps’ across the tail lights. Uniquely shaped front and rear bumpers characterise the e-Golf, and the updated car retains the ‘C-signature’ LED daytime running lights that are embedded within the outer edges of the front bumper. A blue signature trim line runs across the radiator grille and into the headlights, and this is echoed with blue stitching on the leather-trimmed steering wheel and gear knob gaiter. At the rear of the all-electric e-Golf there is a roof spoiler and, of course, no visible tailpipe. All Golfs include Front Assist, which is a safety system that uses a radar sensor to warn the driver of an imminent collision. The system will brake the car automatically if the driver does not react in time. An extension of this is City Emergency Braking, which detects pedestrians moving across the vehicle’s path. Volkswagen’s e-Golf has traditionally been built in Wolfsburg in Germany. It is now being produced in Dresden, too, at Volkswagen’s futuristic ‘Transparent Factory’. The Volkswagen Golf range is one of the broadest that any manufacturer has on sale in the UK. It includes petrol and diesel engines, with the iconic Performance Golfs (GTD, GTI and the four-wheel drive 4MOTION R) at the forefront. The sporty Golf GTE is powered by a petrol-electric plug-in hybrid powertrain and the line-up is complete with the all-electric e-Golf. For more details on the e-Golf and on the comprehensive Golf range – together with brochures and pricing – and to use Volkswagen’s online configurator, visit volkswagen.co.uk.